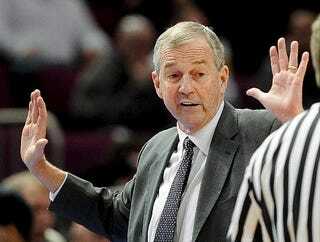 Jim Calhoun Says "We May Have Broken Rules...But We Did Not Cheat"
Every morning, the fine folks at Sports Radio Interviews sift through the a.m. drive-time chatter to bring you the best interviews with coaches, players, and personalities across the sports landscape. Today: The UConn coach makes very little sense about the NCAA's investigation. Jim Calhoun joined WFAN in New York with Mike Francesa to discuss being called a cheater, how those allegations have affected him, the Cam Newton saga, the system and its need for change, presenting his case to the NCAA committee and what and when the NCAA will decide going forward. "Well, it is a hurtful moment. I think all of us, and you're a very opinionated guy and so am I and we both believe what we do, we do to the best of our ability. Quite frankly, and I'm sure you'd be the same guy, every time you said something or did something it hasn't always been right, but it's at least always been what you thought was right at the time. … I said this from Day One, almost two years ago, that if we made mistakes, then that's fine. We'll get our report back in another month or so. The bottom line is we did make some mistakes, but I don't think it's anything hellacious and nothing that would constitute cheating. We may have broken rules or not known about rules or whatever the case may be, but we did not cheat to get basketball players. … You don't even have to like me, and that's fine, but I'm not a cheater and my program has never cheated to get to where it's gotten. That becomes hurtful." "I think in many ways it's made me more forthright in the face of me examining who I am, what I am, what my kids have done. … I feel very comfortable with that. That's the one thing I feel very comfortable about, that by no stretch of the imagination [did we cheat]. … I feel very good about what we've done. I guess the only irritating part is that there are certain things that all of us know and don't like being said. I asked someone a question today, ‘Why would someone bring up the academic possibilities of a guy like Cam Newton?' And he said, ‘Well, simply, he's on top right now.'" "I just feel terrible for him because, quite frankly, I'm still trying to figure out, with the Buckley Amendment, which protects his rights at Florida, how any, quote, information, exactly how it did get out, and what's that got to do with his incredible, incredible performance this year? … He should win the Heisman Trophy from what I've seen thus far, and yet it seems to me they're trying to bring out every other thing that has nothing to do with this one situation that I think the NCAA and the Southeast Conference and obviously Auburn is dealing with. But that seems to be happening more and more. I think one of the Coaches of the Year should be Butch Davis because of what's happened to him at North Carolina." "As far as the NCAA, I think the NCAA does work, to some degree, but I think it's just 356 schools all having too diverse ideas. My own personal opinion would be the fact that you're gonna see the top 125, 130 schools break away. Our goals and our mission, in many, many ways athletically and many times academically, is much different from the other schools. For example, there would only be about 110-20 schools that would vote for two more scholarships. The other 250 schools wouldn't vote that way because they can't afford it. That's not the situation at Connecticut, Duke, all the other schools, obviously. My point being simply is that you see it coming. The Big East is talking about it and it's eventually going to happen where you see possibly a separation there. … You're heading towards where I'd like to be heading toward, a simple set of mandates. I'm not backing out of anything or shirking responsibility. I am captain of the UConn ship, basketball-wise, and I accept full responsibility, but I can't be responsible when I rely upon my university, the NCAA and all of the Big East if things happen beyond my control. And quite frankly, the thing that happened with us, honestly, is a national epidemic. And that's quite frankly runners and agents. That's the thing that's inching its way into virtually every program." • Jeff Fisher, like many before him, thinks he can handle Randy Moss. • Somebody actually wants Gary Barnett's opinion on what's wrong with Colorado. • A.J. Smith blames the special teams for the Chargers' problems.